This year marks the 25th anniversary of the theatrical release of Disney’s holiday masterpiece The Nightmare Before Christmas, and Spirit Halloween is celebration with numerous officially licensed products inspired by the film that are new for 2018 and available to order online now. Among the new items from Halloween Town that we can’t wait to get our hands on are Lock, Shock, and Barrel face masks, an Oogie Boogie mask, an inflatable Oogie Boogie costume, assorted light-up character jack-o-lanterns, plush dolls, and lots more, including the previously reported life-sized singing Sally animatronic and last year’s life-sized Jack Skellington animatronic. You can view some of our favorites below and click on any of the links to purchase, or shop the full collection here. Stir up scares and place some bets just like the most feared boogie man in Halloween Town! This officially licesed Nightmare Before Christmas mask is perfect for becoming the bug-filled baddie himself; Oogie Boogie. Have the most haunting Halloween look and Halloween Town will be yours for the taking! Cause some trouble with Shock and Barrel when you put on this officially licensed Lock mask. Lock’s signature devil mask features pointed horns and a sharp-toothed smile, giving it a look that any trick-or-treater is going to love! Be the smart one of your terrible trio and complete your Nightmare Before Christmas costume with this officially licensed Shock mask! Whether you’re plotting to kidnap Sandy Claws or you’re catching bugs for Oogie Boogie, Shock’s signature witch mask is sure to help you do it in style! 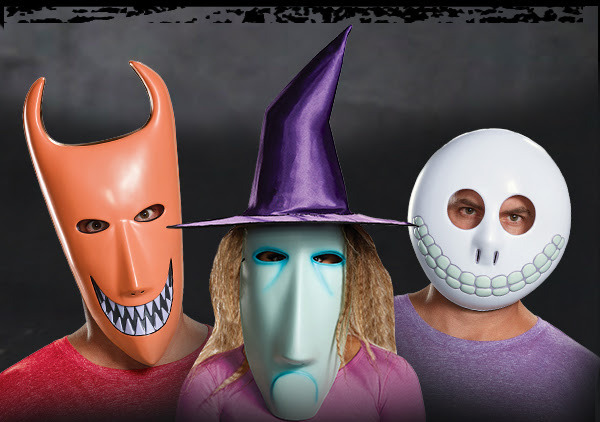 Grab some candy and tag along with Lock and Shock when you put on this officially licensed Barrel mask! This mask features Barrel’s signature round skeleton face, and is perfect for completing your Nightmare Before Christmas costume just in time for Halloween! Enlist the help of Lock, Shock, and Barrel this Halloween when you go on your quest to hunt down Sandy Claws with this officially licensed inflatable Oogie Boogie costume. Even though you aren’t full of bugs, with this inflatable costume you’ll look exactly like Oogie Boogie from the film. With a creepily blacked out eyes and smile, as well as visible seams on the sides this costume will totally be a safe bet! Turn your yard into the best Nightmare Before Christmas scene you could imagine! This officially licensed light up inflatable features two of your favorite characters, Jack and Zero, and a cute little jack-o-lantern detail for added Halloween fun! Get ready to let the best ghost dog guide you through the night! This Zero hanging character display is exactly the light pumpkin nosed décor you’re looking for. You can see much more and shop the full 2018 collection of The Nightmare Before Christmas Halloween products here.